Our Ref 7L: A captivating country estate of exceptional quality situated high on a plateau on the fringe of the Williams River. A "unique sanctuary" of immense comfort and charm this superbly crafted homestead provides: - 5 bedrooms all with built-ins including expansive master suite with ensuite and spa. - Open flowing casual and formal living spaces which spill through Cedar French doors to the outdoor living areas (500 square metres of living space). - Banquet size kitchen with stainless steel appliances, marble bench tops and walk-in pantry. - Exquisite bathrooms with floor to ceiling marble. - Painted external walls in earthy tones. - 90 square metre room currently used as an office with in-roof storage and concealed staircase access. Equally suited to an additional bedroom or entertaining area. - All external walls and ceilings are insulated, Jet Master fireplace, 3 x reverse cycle air-conditioners. - 3 bay brick garage. - 3 bay carport. - Additional self-contained clubhouse with air-conditioning. - Extensive landscaped gardens. - The finest inclusions. Set upon 156 acres of undulating grazing land divided into 10 paddocks. 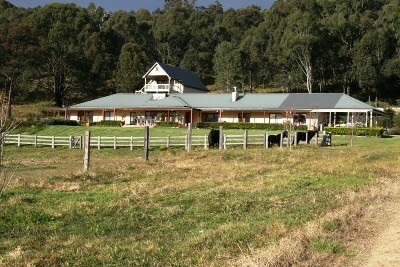 Abundant water - 3 dams - 9 troughs including easement to the Williams River and resort style pool. "Yellow Box Farm" combines elegance and beauty in a serene environment. Please contact Tavis Chivers for more information 0428 921704.